Looking for a day of cheap fun? Looking to cool off on a hot summer day? Looking for a tube rental place that will provide you quality service without haggling over the price? If so, then you need to come by JJs Tubes and go tubing on Deep Creek. JJ's Tubes is conveniently located just outside the Great Smoky Mountains National Park. JJ's has been family owned and operated by local school teachers for over 30+ years. 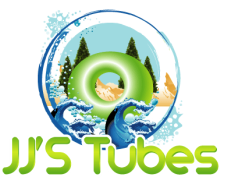 JJ's Tubes has tubes in all sizes and types. In addition to helping you select the appropriate tube for you and your family, JJ's friendly staff will tie your tubes down on your vehicle and answer any questions you may have about tubing on Deep Creek. We will also provide you with a map of the park which shows the picnic area, trails, and different tubing areas in the creek. Many families elect to spend the entire day in the park. If your planning to do so, we suggest packing a lunch and taking advantage of the beautiful picnic area located in the park. In addition to tubing, there are numerous hiking trails that display the beautiful Great Smoky Mountains.